Mark Winslow is the controversial member of the Tennessee Republican Party State Executive Committee who worked for, and I assume is still working for, a Democrat candidate for judge in Davidson County. Our own vastly more qualified candidate in this election is Marian Cheadle Fordice. Mark Winslow, despite being a member of the State Executive Committee is supporting Democrat Melissa Blackburn. 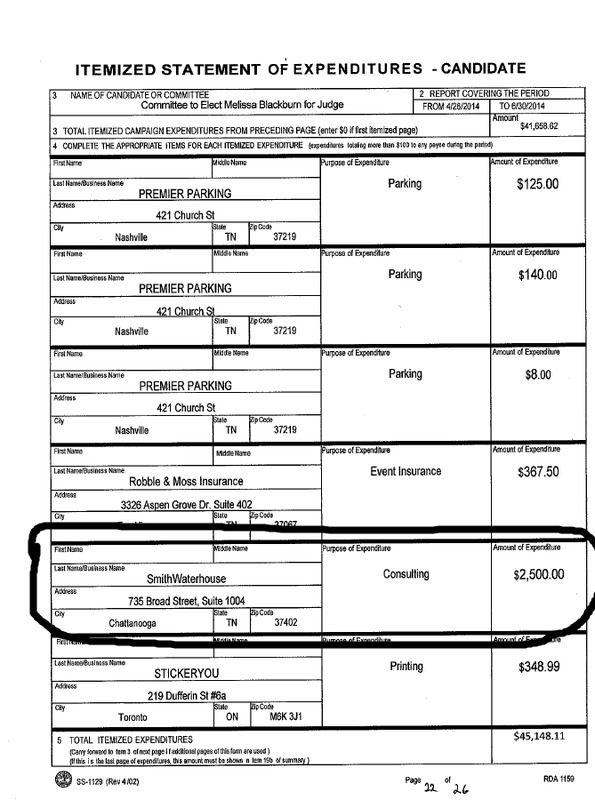 Below is a copy of page 22 of Melissa Blackburn's campaign finance report showing that for the period from 4/26/2014 to 6/30/2014 the Blackburn campaign paid Smithwaterhouse $2500. Winslow, when confronted about working for Blackburn early on, used the excuse that Blackburn had hired the firm he works for, Smithwaterhouse, to manage her campaign and he was obligated as an employee of Smithwaterhouse to fulfill his obligation. I know people have to make a living but I don't believe one can serve two masters. One cannot be loyal to their Democrat client and loyal to the Republican Party at the same time. 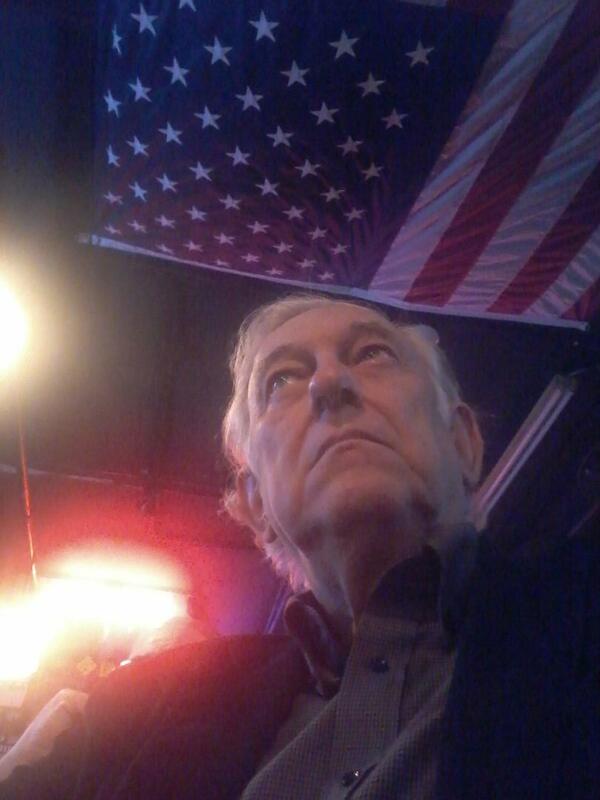 Winslow by serving on the Republican State Executive Committee has a voice in how much financial assistance the Party gives their nominees and he has access to Republican mailing list and contributor list and inside strategy. It is so obvious a conflict of interest that I do not see how anyone could justify serving in both capacities. If Mark Winslow was an honorable person he would have either resigned his employment or resigned his position on the State Executive Committee. Smithwaterhouse Stategies, Winslow's employer, is a public relations and lobbying firm headed by Robin Smith and Albert Waterhouse. Smith is a Republican and has served as chairman of the Tennessee Republican party and Waterhouse is a Democrat who has worked in lots of Democrat local, state and national political campaigns. I know this type of arrangement is not unusual and I may be naïve, but I think it is comparable to being a mercenary who will fight for who ever will pay him. I do not think a principled person can work for whoever is paying the bill. I think politics is more than just a fun job. I think it matters which side you are on. There is a more recent campaign report running though July 31st but I have not had a chance to see that report, so do not know how much the Blackburn campaign has paid Smithwaterhouse in the last month. When I get that report, I will post the results. Please, on August 7th vote for D. J. King, if you live in District 19. King is running for the SEC against Winslow. We need real Republicans on the SEC. Also please vote for our Republican Candidate for judge, Marian Cheadle Fordice. Personal attacks, tempers flare at Nashville GOP meeting over Mark Winslow's conflict of interest.